Before summer blockbusters run on the big screen, audience members are bombarded with ads against “the grocery tax,” as the soda industry prefers to call it, while our city’s proposed sugary drinks tax is discussed in publications from NPR to the New York Times. Kenney’s proposal, which would cover soda, “juice” drinks and sports drinks but not diet beverages, would induce a levy of three cents per ounce for distributors rather than at the point of retail. But it is widely believed that the costs will then be passed on to retailers and then consumers. In addition to raising the $400 million over five years for pre-K, parks and rec rehabilitations, and other worthy causes, it is also thought that the consumption of soda will decline. The soda industry will fight down to the last cartridge to prevent Kenney’s proposals from coming to pass. But it remains unclear whether his tactic of emphasizing the programs that will be funded by the revenues, rather than the health benefits, will prove a winning one. City Council has to pass its own version of the budget by May 30. Then Kenney has about a month to approve, veto or decline to sign the budget – by June 30. A mayoral veto can be overridden by a council supermajority (12 members). If the mayor fails to act – refusing to either sign or veto – the budget automatically goes into effect. Philadelphians confused or worried about the outcome do have several points of reference to consider. Just two years ago Berkeley, California became the first American city to pass a tax (one cent per ounce) on sodas and other sugary beverages. In 2014 Mexico passed a one peso per liter tax on soda, while several states have had much smaller taxes on the beverages for decades. We looked at the research and the campaign literature to find the following lessons learned in our predecessors' efforts. But a different study, in the American Journal of Public Health, found very different outcomes. Published a few months later than the NBER study, but covering a similar time frame, it found that the tax had increased the price of soda and other sugary beverages in comparison with neighboring Oakland and San Francisco. In Berkeley, the researchers found price increases that were almost 70 percent of the excise tax for soda and almost 50 percent for other sugar-sweetened beverages. “This first empirical evidence of early pass-through at the city level foretells pass-through of SSB [sugar sweetened beverages] excise taxes in other cities,” the report concludes. Asked about the disparity between the findings of the two papers, Jennifer Falbe of the Berkeley University School of Public Health (one of the authors of the second paper), responded to PhillyVoice via email. Mayor Kenney is no doubt aware how skilled the soda industry is at repressing these taxation efforts. After all, he voted twice against attempts by his predecessor, Mayor Michael Nutter, to implement smaller versions of the current tax. Councilman Kenney isn’t the only one who decided not to beef with the soda giants. In 2009, the Obama Administration proposed a soda tax to help pay for what would become the Affordable Care Act. The amount spent on lobbying activities by Pepsi, Coke, and the American Beverage Association shot up from $3 million in 2008 (roughly the same amount it had been for the previous decade) to more than $37 million. The proposal was quickly dropped. The battle hasn’t gone much better at the city level. Philadelphia isn’t the only city where the soda industry has crushed legislation that would regulate or tax sugary drinks. Even in the San Francisco Bay Area, taxes on soda were defeated in Richmond and San Francisco itself, although in the latter case a majority of voters approved the initiative. Observers believe the Berkeley effort was successful because its backers waged a door-to-door effort to educate voters on the tax and its implications. There are numerous studies that show that in-person voter outreach is far more effective than, say, TV advertisements. And that seems to have borne fruit in Berkeley. In 2014 Mexico implemented a one peso per liter tax on soda sales in the county. City Council president Darrell Clarke has expressed exasperation at the idea that Philadelphia can learn anything from the Mexican government's experience with the tax, but there is no reason to believe the lessons wouldn’t be exportable. And the result, perhaps unsurprisingly, is that people did indeed drink less soda. In 2014, the year the tax went into effect, soda sales fell by six percent but the tax seemed to gain momentum as the year wore on with the largest declines coming in the later months. Low-income people in particular consumed markedly less soda, with sales among that demographic reaching as high as 17 percent. The tennis courts at West Mill Creek are damaged and unusable. 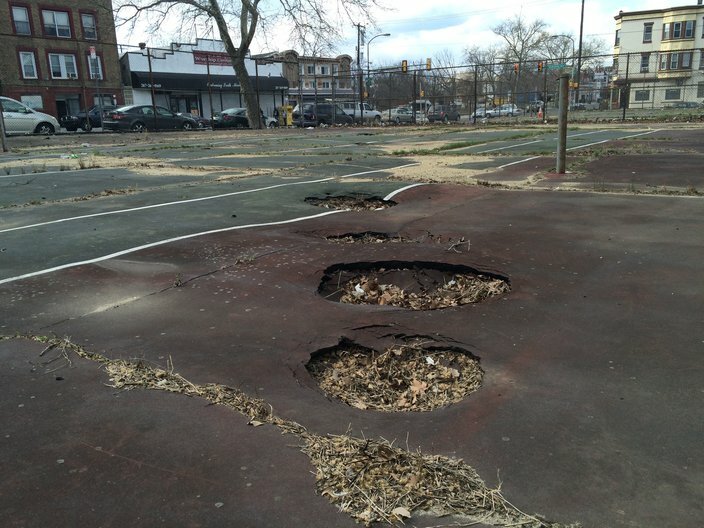 People haven't played tennis here in nearly twenty years, said local residents. Kenney has repeatedly emphasized that his tax differs from Nutter’s proposals in that he isn’t emphasizing the health benefits and thereby evoking the dreaded nanny state. Instead our mayor is just in it for the money, which will be earmarked toward specific and popular programs. History seems to show that Kenney’s tactics could be quite effective. This truth was also learned during an earlier round of soda tax efforts in the 1990s. Not often remembered today, Arkansas and Ohio both passed soda taxes in 1992. These were far smaller than any of their contemporary counterparts: a mere one cent per 12 ounces in Ohio and two cents per 12 ounces in Arkansas. Nevertheless, the soda industry attacked both. In Ohio, the soda industry operated under the guise of the Stop Taxes on Food Committee (like today’s No Philly Grocery Tax astroturf group). Although the Republican governor and his allies in organized labor tried to promote the tax, it proved unpopular in the Buckeye State – in large part because the revenue went to slosh around in the general fund. In 1994, Ohioans voted to repeal the tax by a two-to-one vote. In Arkansas, on the other hand, the soda tax was twice the size but earmarked for Medicaid. In 1994, a campaign similar to the anti-food tax effort in Ohio tried to get voters to repeal the soda tax. Losing that effort 55-to-45 percent, the soda industry tried to get the legislature to repeal it in 1997. That didn’t work, either. A soda tax earmarked toward social services seems to have a far better chance. The exception would seem to be Berkeley, which didn’t earmark it for fear of having to win a super majority of support due to quirk in California tax law – but city leaders promised unofficially that the money would be spent for health and social services. The strongest argument against the sugary beverages tax is that it is regressive, which it is. The Philly tax would be taken out at the level of the distributors, which Kenney claims makes it not regressive. But the Berkeley experience seems to show that much of it will indeed be passed on to consumers. Those consumers are far more likely to be low-income and, also, more likely to spend a larger portion of their small incomes on sales purchases like soda. There are arguments that as far as regressive taxes go, soda taxes aren’t the worst. (“Diabetes are very regressive,” notes Nestle.) The extra $2 tax levied on cigarettes in 2014 is arguably more so, given that people who are addicted to nicotine are chemically hooked in a fashion that probably doesn’t apply to soda drinkers. In fact, many are probably just responding to the market incentive that soda is cheaper than most other drink options—a result of the switch to high fructose corn syrup. For Schmitt, Kenney’s assessment that there are no other good options is likely correct. Philadelphia’s tax base is weak, and Bernie Sanders’ suggestion that we tax the rich instead doesn’t really work: Philly doesn’t have that many wealthy people and the state’s uniformity clause mitigates against targeting the rich for a special tax as done by states like New Jersey and California.